Custom Shirts (and more) for Groups! Customized Girl is very pleased to announce a new group discount structure on our most popular items! We are now offering very steep discounts starting at 6 items. As an example, if you are buying 12 basic tees, the price will drop from $16 to $14 each. At 24, the price drops to $10. At 36, it is $9. And at 48, the price will be cut in half, to only $8 a shirt. We’re increasing our group discounts because we’re in a battle with screen printers, and we want to win. This has very interesting, and indeed joyous, results for our customers. Our discounts start at 6 items. This means you can add any six items, featuring any six designs, and you will see a discount in your cart. It doesn’t matter if your items match or if your designs match, we’ll still give you the discount. Screen printers cannot operate this way, because there are a lot of set up costs for each screen. You need to get the same design on items of the same size. But not at Customized Girl. If you want to personalize each shirt with each person’s name (or funny nickname), it’s no problem for us. Add as many colors as you want, it won’t cost a dime more. This means you can add full-color art from our enormous library. You can upload full-color photographs. You can add ten different text colors. For screen printers, each new color means a new screen, so the price goes up quickly. Since our group pricing is now set up to compete with one or two color screen print pricing, the result is that you can get full color custom shirts at high quantities for incredible discounts. No minimums. Our process is the same if you order 1 item or 100 items, so we are happy to offer great prices for just one item. No set up fees. Because we’re not using screens, there is no set up! Fun fact about popular items only: the discount increases at every integer. Buying 7 items gives you a bigger discount percentage than buying 6. 8 items is better than 7, and so on, all the way to 48. Fun fact about all items: each item on our site is divided into “popular items” and, uh, let’s just say “everything else”. Each item is discounted based on which category it falls into. Let’s say you buy 3 popular items and 3 everything else items. Together, your order qualifies for the 6 item group discount. The 6 item discount for your popular items will be 6.2%. The 6 item discount for your everything else items will be 5%. Cool? CG Group Shots: Brownies Troop Camporee 2011 Custom T-Shirts! For kids everywhere, summer is all about fun outdoor activities and camps! Cheerleading, theater, art, softball, volleyball and band are just a few examples of camps and workshops kids attend during the dog days of summer! One of our own customers sent us photos from her girl scout troop’s “Camporee 2011” and we couldn’t be happier with how they turned out! Corissa customized 12 Youth Short Sleeve Layered Tees in Berry/Pink with “Old Vail Girl Scout Camporee 2011” with bonfire art on the front, and “Brownies Troop #9919” plus all the girl’s names on the back! For herself and her helpers, Corissa customized three Misses Relaxed Fit Basic Tees in Light Pink with the same text as the girl’s on the front and back. If you would like to make your own custom t-shirts for your next camp, check out CustomizedGirl.com‘s selection of camp tees! We have a design center that’s super easy-to-use, and all kinds of art, texts and effects that will make your next personalized shirt one-of-a-kind! BACK BY POPULAR DEMAND: BOGO 50! CG726: Get 50% off a Basic Tee if you buy a Basic Tee! This time the offer includes Junior Fit Basic, Misses Relaxed Basic, Guy’s Crew Neck Basic and, AND Youth Crew Neck Basic. Ends 8/01/11, 11:59 PM EST (not available with any other promos.) One offer per order! Get customizing! Think that the only way to get great custom business shirts is to have them silk screened? Well, think again. Thanks to the internet and advances in printing techbology, you won’t have to use a screen printer ever again. 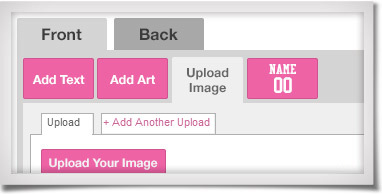 Creating your own business shirts is as easy as 1-2-3 when you use CustomizedGirl’s image upload option. 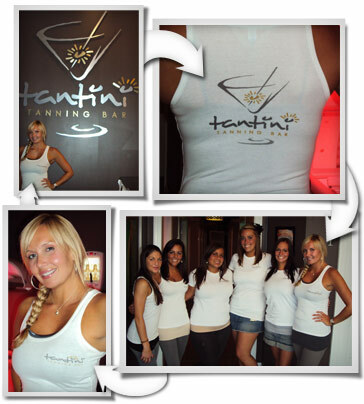 With Customized Girl’s design center you can create custom shirts, custom tank tops or custom bags for your business! Before designing your custom business shirt, you’ll need to make sure your company logo or image is in an accepted format and size. Customized Girl’s accepted formats are JPEG, GIF and PNG. When sizing your image, it should not exceed 10 Megs. For the best image quality, using the largest size is recommended, at least 1000 pixels in height or width. Now that you have your logo or image in an accepted format you can begin designing! You can either start with a blank item or start with a design. 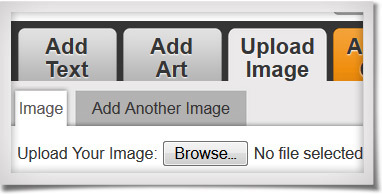 Once you have reached the design center simply select the Upload Image tab. Browse and find your image and then upload it to your design. Then when your image is uploaded you can finish your design! Add the special touch to your business shirt by adding text or accent art. Want to create several different products with the same design? Not a problem. When you’ve finished your first product, enter the quantity and add it to your cart. Once you are viewing your cart you can select the option to copy the design. Select copy design (this will open up the design center again) and then swap out the item for a different item. Tips & Tricks: You don’t have to use just rectangular images when uploading images. You can use a photo-editing tool, such as Photoshop, to create a cut-out of a particular part of a rectangular image. Don’t have a photo editing program on your computer? Don’t worry we can do it for you. Just leave a note in the special instruction field that you will find near the end of the checkout process. TANK SALE! NO CODES NEEDED! Get 20% off our Longer Length Tanks! Three varieties to choose from! Ends 7/25/11, 11:59 PM EST (not available with any other promos.) Stock up on those summer tanks! FEAST YOUR CUSTOMIZING EYES! More summer vector art! We’re mid-summer but things are still heating up. Find these and more in our design center by searching our art for vacation, camp, travel and beach. Under the Art tab, simply type it in the search field what you are looking for, click “SEARCH” and watch all your choices pop up. Easy as that! Check it out! CG712: Get $10 off your $50+ order! Ends 7/18/11, 11:59 PM EST (not available with any other promos.) Stock up on some summer tanks! This blog post is for all of our cheerleaders, cheer moms, and cheer coaches. We know how every detail matters when it comes to competitions and games. If you care about your routine music as much as you care about the bags and shirts that you make on our site, then we’ve got a website for you. Custom Cheer Mix is a service website where you can have custom mixes created for your squad. The Custom Cheer Mix website provides users with a wide variety of information dealing with music mixes and routines. They supply users with some unique tools to help them to not only choose their music, but to also help in the routine creation. The routine counter supplies music samples of the different beats per minute, as well as, the 8 count for each number of beats per minutes. Already created the routine? Custom Cheer Mix can create music to match your routine based on the 8 counts you are using. So whether you are looking for a custom music mix now or for the future, you have got to check this site out. Update 1/31/12: Here’s a preview of this season’s most popular custom cheer shirt! 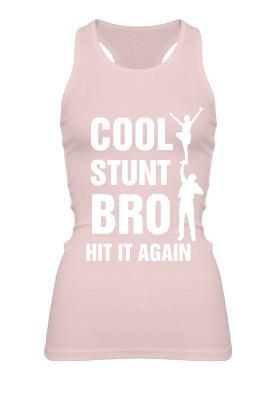 Join the craze and order your very own Cool Stunt Bro Hit It Again Shirt today!